Does your vinyl siding need a makeover? Did you think you'd need to spend a ton of money and replace your vinyl siding? Think again. Yes, vinyl siding can be painted. If your siding is looking faded or worn, or if you’ve just grown tired of the color, you may choose to paint your vinyl siding. Mars Painting has been painting and serving customers all across the area since 1992. When our painters complete the painting of the vinyl siding on the exterior of your home, you’ll feel like you practically have a new house! All of our painters are highly skilled and trained to provide our customers with the finest quality services. We use only the highest quality products to achieve maximum satisfaction and a superior end result. 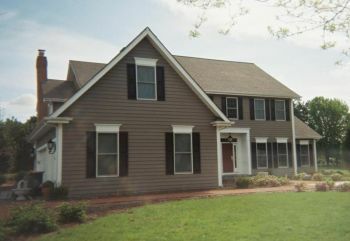 Paint vinyl siding in ideal weather conditions, which are mild temperatures and low humidity. Choose paint which contains acrylic and urethane resins which accommodate the expansion and contraction of vinyl. Also select the same shade or a color which is lighter than the current color. Prepare the surface by cleaning the surface thoroughly using soap, water and bleach to remove mold, chalky buildup, and debris. Apply 2 coats of paint using a roller or a sprayer. Mars Painting knows what it takes to successfully complete your vinyl siding painting job which will last you years to come. Call Mars Painting at (224) 358-3538!